Modern climate pseudo-science is renowned for making very alarming prognostications about the “disappearing” Himalayan glaciers. Glaciers in the Himalaya are receding faster than in any other part of the world and, if the present rate continues, the likelihood of them disappearing by the year 2035 and perhaps sooner is very high if the Earth keeps warming at the current rate. Modern climate pseudo-science is also very well known for blaming humans for “global warming”, “disappearing” Himalayan glaciers, increasing levels of “greenhouse gases” and anything else they can cook-up. The receding and thinning of Himalayan glaciers can be attributed primarily to the global warming due to increase in anthropogenic emission of greenhouse gases. The relatively high population density near these glaciers and consequent deforestation and land-use changes have also adversely affected these glaciers. The poster child for the “disappearing” Himalayan glaciers is the Gangotri Glacier which retreated [on average] at a rate of 28 metres per year between 1977 and 1990. The 30.2 km long Gangotri glacier has been receding alarmingly in recent years. Between 1936 and 1996 the Gangotri Glacier retreated by 1,147 metres. NASA, in conjunction with scientists from United States Geological Survey (USGS) and the National Snow and Ice Data Center (NSIDC), is developing a global inventory of all the world’s glaciers to help researchers track each glacier’s history. According to them, the Gangotri glacier, currently 30.2 km long and between 0.5 and 2.5 km wide, is one of the largest in the Himalayas. 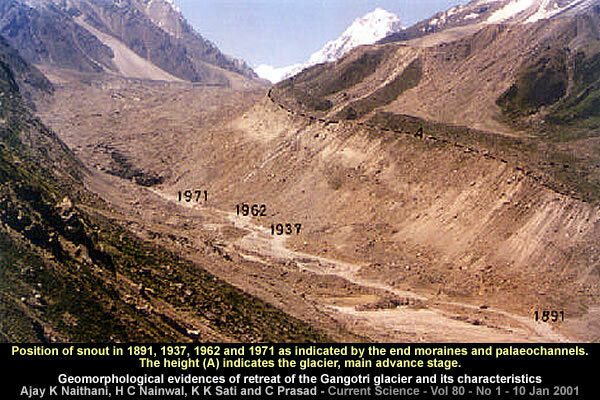 Data for 61 years (1936–96) show that the total recession of Gangotri glacier is 1147 m, with the average rate of 19 m per year. However, over the last 25 years of the 20th century it has retreated more than 850 meters (34 meters per year), and 76 meters between 1996 and 1999 (25 meters per year). 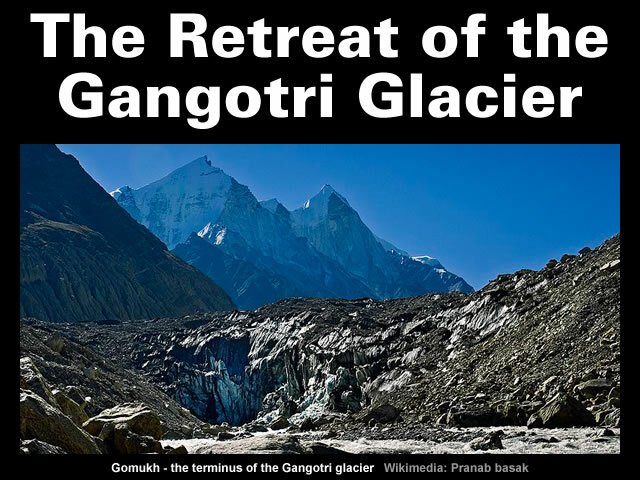 Establishing when the Gangotri Glacier started to retreat is a very interesting exercise. Wikipedia leaves the casual observer with the impression the retreat began in 1780. This glacier has been constantly receding since measurements began in 1780. M C Sharma notes the Gangotri Glacier has “retreated by over 3 kilometres since 1817”. V K Raina notes the Gangotri Glacier has retreated 12 kilometres in the last 500 years. Birbal Sahini Institute, Lucknow, has dated the trees that are growing over the old terminal moraines at Bhujbas, about 12 km downstream of the present Gaumukh to be about 415 years old. This would mean that the terminal moraines at Bhujbas would be about 500 years old, as some time gap must have occurred between the vacation by the glacier and growth of vegetation. And, overall, the Gangotri Glacier has probably retreated 47 kilometres. A survey of the Rhagirathi valley, downstream of the Gangotri temple, has revealed the existence of numerous characteristic glacier land-forms like: glacier pavements, saw cut trenches, link cavity system and till deposits almost up to Jangla, a linear distance of 47 km from the present snout position. 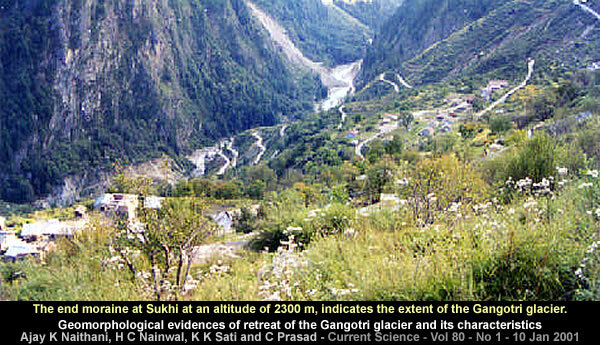 The Gangotri glacier in the past had extended up to the Sukhi, below Jhala (40.5 km downstream of Gaumukh) in Bhagirathi valley, as indicated by the remanents of moraine at an altitude of about 2300 m.a.s.l.. This is the oldest terminal moraine of this glacier and its position probably represents the position of the snout during Pleistocene. 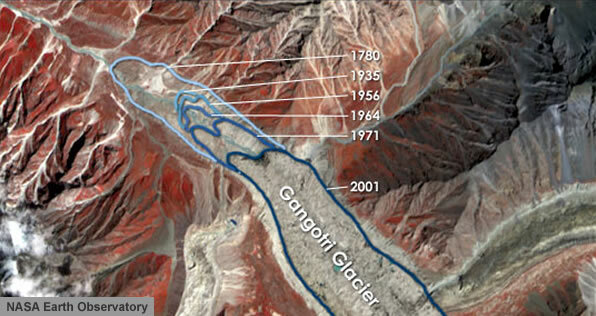 The mainstream suggests the 47 kilometre retreat of the Gangotri Glacier occurred in the last 10,000 to 100,000 years. This resulted in the expansion of the glacierized area in the form of a long valley glacier system covering a minimum area of 685 sq km, during Bhagirathi glacial stage (105 years ago). These results should not come as any surprise to anyone who can read a map. 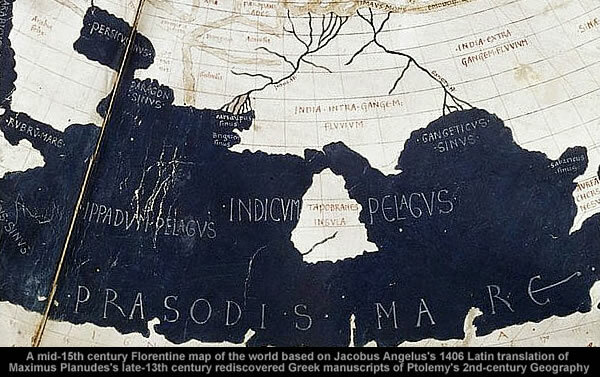 And one of the more devilish details the Gradualist Geologists prefer to ignore is the cartographic evidence that suggests Southern Indian collided with Asia less than 2,000 years ago. The collision of Taprobane with Northern India probably occurred at the Arabian Horizon [circa 637 CE] because the island was known to the Ancient Greeks. Gallery | This entry was posted in Arabian Horizon, Atmospheric Science, Glaciology, Heinsohn Horizon, History, Indian Impacts, Old Japanese Cedar Tree. Bookmark the permalink. tsars at a tremendous cost and peril (think expeditions). ===> ca 637 CE: what would be the date in corrected chronology? Quote: “– the glacier has – – – – 47km in 10000 years”. Considering that it is at a latitude of about 30 degrees, melting would have started at the end of the YD. That does not point to any human induced triggering. But it would be interesting to find out what it might have done at around 2345bce, — perhaps an abrupt increase in melt rate? At about that time the Quelccaya made an abrupt advance. So abrupt that growing plants at the edge of the ice were then buried and preserved under the ice from that time; to be found by Lonnie Thompson. Note that the Quelccaya is within the tropics. That may be another piece of evidence that says Dodwell was spot on. Yry has made ref to coins. Coincidentally, having a long time interest in coins – and metal detectors – I’ve been looking over Spink ‘Coins of England’ 2018, mainly the range of coins between dates 600 -775 ce and on to 1400. Also comparing with Islamic coins from 622 – 719 and onward. Plus comparing from known finds from the Med. Note that in the last few decades when metal detectors became easily available many new finds have been made. The period 600 to 1200 is quite well covered with both personalities and their coinage, in England, in the Islamic areas and around the Sicily during that period. I have sent this to the FB page of Electric Universe Weather. Excellent work. Gives a 25 fold decrease in geological time scales. I put it at 50 for the period. I talked to a brilliant Indic scholar during a diner who said that traditions said that mts. 3 thousand years ago were on average 1 mile high, 2 miles high 2 thousand years ago, and 3 miles high a thousand years ago. I reminded me of the traditions of South American tribes as well. I am hoping that someone knowledgeable can tell me a citation for it.